Love the Tour du France? Love Coffee? Then you simply need to have an espresso set from Coffee and Cols. No matter whether you are feeling fast, consistent, a mountain goat or a world champ when you wake up in the morning Coffee and Cols have the espresso cup for you. Prefer mountain biking, no problem, prefer tandems? not sure this is the right blog for you but no problem. Swear by fixies? Ok now we have gone to far. My favourite is the world champ mug, Timeless! Have a look at their site for the widest choice I have seen so far! 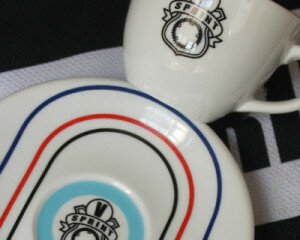 Now if any company were to produce an velodrome shaped espresso cup it is V-Sprint (If you don’t know why google it!) and if you are going to make a velodrome shaped espresso cup it better look amazing. Luckily the guys at V-Sprint have done just that. 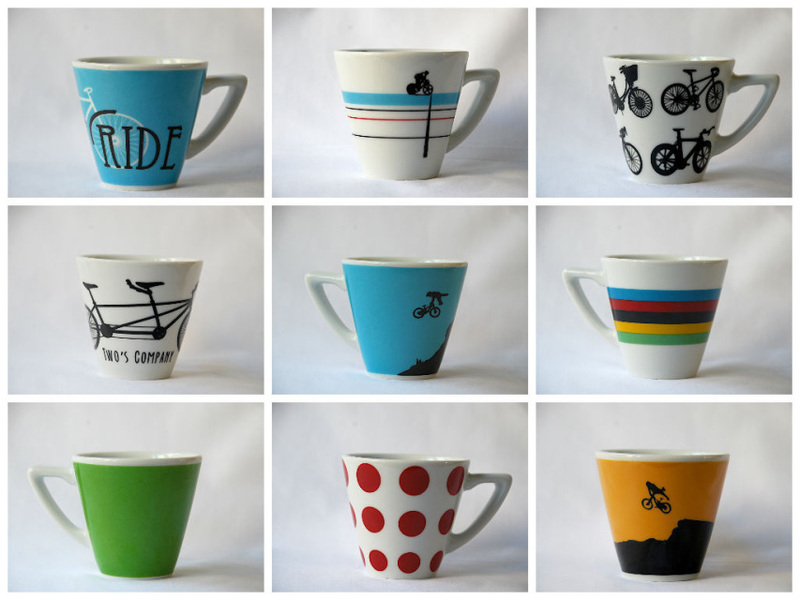 This espresso cup comes from guys and gals with some serious cycling heritage, so make sure you add these to your collection as a point of principle! 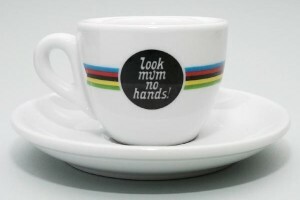 This is one fast espresso cup! 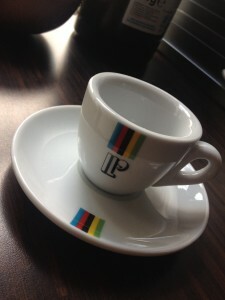 Nothing makes an espresso taste so good then when your drinking it out of a proper thick walled espresso cup and Il Soigneur have delivered! Look Mum No Hands have hosted the likes of Gary Fisher and Graeme Obree on the Cycle Show so are no strangers to quality! 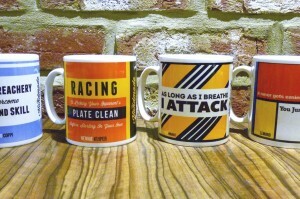 Prefer a longer cup of coffee try a set of four mugs featuring a great sound bite and a design based on a classic jersey worn by past riders. 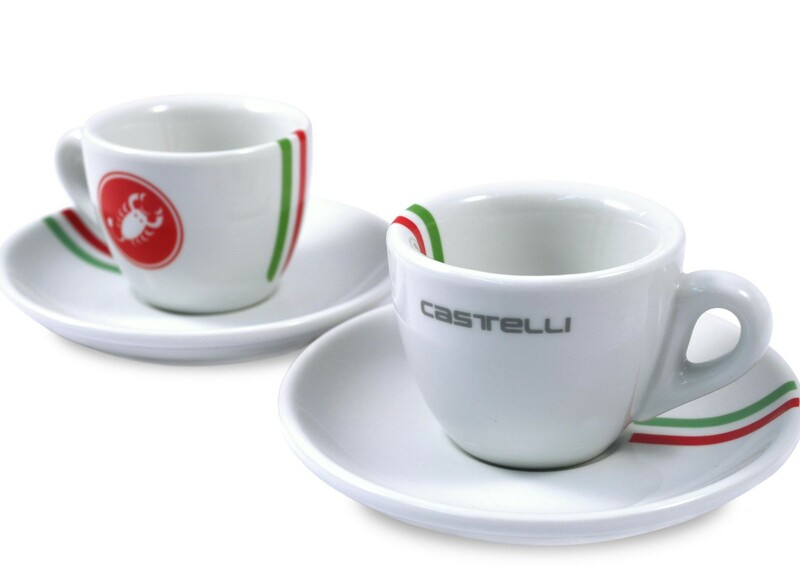 This entry is not truely from an independent retailer but given that Castelli Cafe support the UK cycling industry by sourcing their musettes from a local producer (il Soigneur again) they are most worthy of a mention. Adding these to the cups above is going to give you a who’s who of espresso cups when your mates come round for their pre ride medication. 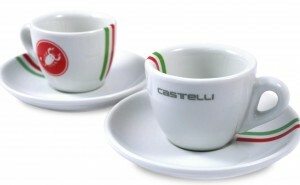 They are not the cheapest cups on my list but when were Castelli ever cheap? 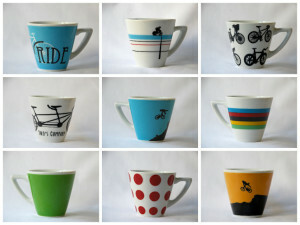 The Beautiful ride cups came to my attention a few weeks ago so it seamed fitting to add them to the list. With 5 different styles (British Winner being my favourite and shown here) and the ability to buy them in sets makes this the most comprehensive choice in my roundup makes for a compelling reason for you to check them out. ← Condor Acciaio – A year on! You do! I have added them! 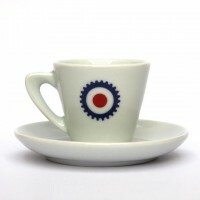 We’ve got some lovely espresso cups to suit all types of riders http://www.thebeautifulride.co.uk/product-category/espresso-cups/ and a couple of tea mugs as well http://www.thebeautifulride.co.uk/product-category/mugs/ Our prices include free postage in the UK.